Completely dipped in the green, the country house is constituted from a typical independent stone cottage, totally refurbished, with a wide garden (2,500 sq.m.) and a refreshing swimming pool (12x6 m), open from the end of May to all of September. The entire structure is just in the centre of the Tenuta, guaranteeing therefore the maximum of tranquillity. There is accommodation up to 10 peoples, television, telephone, washing machine, dishwasher, an enormous fireplace and a fully equipped kitchen. Upon request, it's possible to arrange cradles. 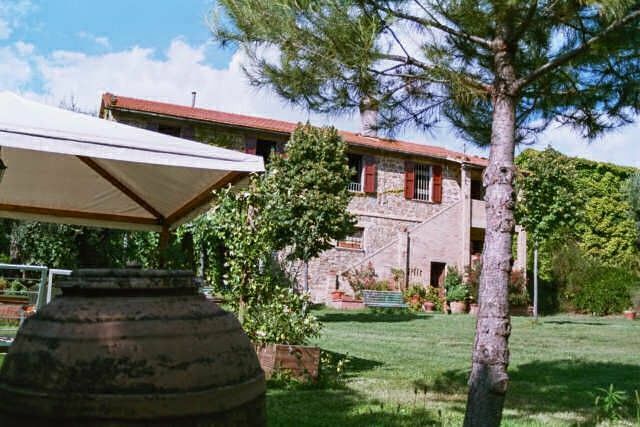 It is located in the countryside of Torgiano, a few minutes drive from Perugia, Assisi and Todi. Quietness and tranquillity are guaranteed. The Tenuta comprises over one hundred hectares, subdivided between seeded fields, olive trees and grapevines, and interleaved by wooded canyons, allowing long and healthy walks, during which it's easy to meet several animal species like pheasants, hares, foxes, badgers, wood pickers, and porcupines. Golf courses: There are two different Golf Courses near the Tenuta: Golf Club Perugia and Antognolla Golf. We stayed 2 weeks in this house with a family of good friends. Everything was as described. Great swimming pool, which was used every day. Quiet surroundings. Close to Torgiano, Perugia and Assisi. We have even made a day trip to Rome (by train). All perfectly maintained, owners very helpful. For our needs the price / quality = top! In the countryside between Torgiano and Perugia, with Todi, Assisi and the Trasimeno lake a few minutes drive away. Visit the medieval town of Spello, or see the beautiful mosaics in Orvieto. Or enjoy some great wine tasting in Torgiano, Orvieto and Montefalco with the famous Sagrantino. See the tallest falls in Italy, Le Marmore, and enjoy rafting in its nearby. 300€ cash security deposit on arrival. Additional free cleaning(s) for stays longer than 2 weeks. All inclusive, no additional costs (except for phone usage). Discounts for longer stays, please inquire. Additional services and special requests can be provided, please inquire.